Weighing In On New Luggage | OhGizmo! At my previous job I did a lot of trade-show related travelling which involved transporting drive arrays and computer equipment carefully buried inside my suitcases. As a result on many occasions my luggage was tagged as being ‘heavy’, though thankfully I never incurred additional charges. Ricardo Beverly Hills now takes the guess-work out of wondering if your luggage will tip the scales at check-in. 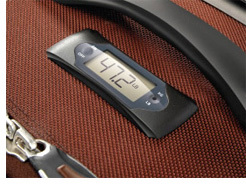 On top is a simple LCD that will display the weight of the suitcase in either pounds or kilograms, and will alert you when the bag has exceeded the standard 50-pound weight limit. The company assures that the technology behind the internal scale is robust enough to survive the rigors of travelling. The Ricardo luggage with built-in scale will be available in 25 inch and 28 inch sizes and will retail for around $200 at most “fine” department stores. Isn’t it a BAD idea to have an electronic device complete with LCD screen on your luggage? Wouldn’t a device like this aggravate EVERY airline security checkpoint it ever has to go through? Can someone please advise what weight this goes up to, i.e is it limited to 23KGS/50LBS or goes up to beyond 32KGS/70LBS?? ?